ROSEMÈRE, Monday, December 17, 2018 – Mayor Eric Westram presented the 2019 budget estimates that were adopted by Town Council at its special meeting on December 17. The operating budget of $31,646,000 has been prepared at a time when Rosemère must face significant budgetary challenges, due to the record investments made and committed in 2017. For Rosemerites, these investments represent a tax burden of $900,000 annually. "Soundly managing Rosemerites' money with the utmost care is a constant concern. Governing sometimes requires making difficult decisions to maintain our enviable position. We remain focused on our strategic vision of making Rosemère a proud, green and prosperous city. For the Rosemère of tomorrow, 2019 will be a decisive year," stated the Mayor. With "Defining our future together" as the theme, the 2019 budget is planning measures to consolidate the public dialogue and proximity approach implemented since the present members of Town Council took office at the end of 2017. Consultations with residents are therefore planned for 2019 in order to define the Town's urban planning vision and to provide Rosemère with infrastructures in line with its ambitions and resources. $0.5363 per $100 of assessment. Due to the deposit of the three-year assessment roll for 2018-2020, the tax bill for 55% of homeowners will therefore rise 4.1% or less. Owners of an average home ($431,000) will consequently see their tax bill increase approximately $100 in 2019. For the non-residential sector, the tax rate for companies and commercial establishments will be set at $1.6844 per $100 of assessment. The impact for the non-residential sector is different for each of the commercial establishments, depending on the variation in values on the assessment roll. Despite these measures, Rosemère is maintaining its enviable position in the region and in Québec as a whole. In 2018, the owners of an average home in Rosemère, valued at $431,000, paid $378 (14%) less in property tax than for the average home in the other neighbouring municipalities, while enjoying a higher value of 28% of their property. "We will keep up our efforts so that Rosemerites pay less tax and gain more value for their homes than elsewhere," added the Mayor. 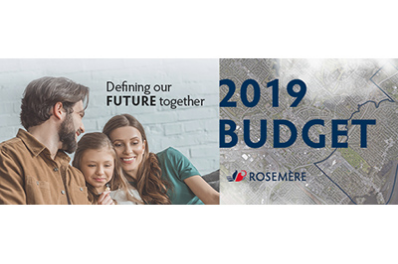 The 2019 budget will allow Mayor Eric Westram's Administration to initiate investments of some $9.4million in Rosemère's future, with no impact on long-term debt. Most of the investments will be focused on sewer and water infrastructure rehabilitation for an amount of $4.6million as well as $2.1million in parks and playgrounds. In addition, investments of $1.4million are planned in the road network. Following public consultations scheduled for 2019, a number of other investments may be made, depending on the choices of the citizens.